Participants provide their own four wheel drive vehicle; take care of their own food and non-alcoholic beverages for the trip. Suggested essentials, beyond plenty of water, include sun protection, and layered clothing in case of changing weather circumstances that are always a possibility during the spring in southeastern Utah. There is truly something for everyone here in Moab Utah. That is why it is referred to so often as the Mecca of 4wheeling! There are trails for all abilities, some for two wheel drive vehicles, while others require seriously modified vehicles. Vehicle safety equipment is extremely important. It is essential that participants stay on the designated routes, and that some basic rules are followed. RECOMMENDATIONS: We recommend that each vehicle carry a fire extinguisher, first aid kit, tow strap, and a spare tire. All of the trips travel across federal and Utah State lands on established roads, and even through some private land sections. RULE 3: STAY ON THE TRAIL/ROADS. The organization files the required permits according to the number of participants in each group, and pays the associated fees which are included in the cost of registration. It is critical that participants respect the land and follow the guides, staying to the designated route. This is absolutely essential for anyone visiting the backcountry in and around Moab throughout the year. RULE 4: MULTI-USE TRAILS All trails are open to the public, so please respect others, which will include mountain bikers, hikers, and people on horseback. STREET LEGAL VEHICLES: Please read attached “Utah Street-Legal ATV Requirements” in your packet. Main Street (191) is completely off limits for travel in town, but you’re allowed to cross at 90 degrees. All participants will leave and return from the trailheads with the police escorts, unless trailering to the trail heads. After returning to the Arena, you’re more than welcome to drive on the side streets if you are street legal. Check here for information regarding off-highway vehicle rules and regulations. Please look up your state to see if you need any permits for riding in Utah. 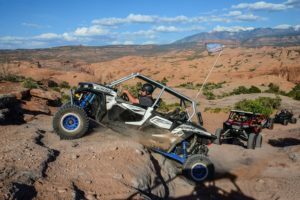 No one under eight years of age is allowed to operate any OHV on public lands, roads or trails in Utah. 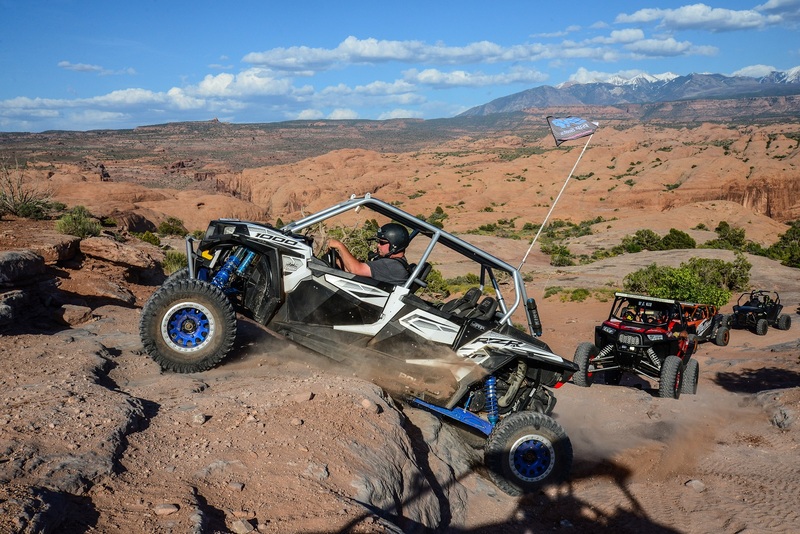 Operators eight through 15 years of age may operate an OHV provided they possess an Education Certificate issued by Utah State Parks and Recreation or equivalent from their home state. Resident operators 16 years of age or older may operate an OHV if they possess either a valid driver’s license or an OHV Education Certificate. Education Certificates are issued to anyone eight years of age or older who completes Utah State Parks and Recreation’s Know Before You GO! OHV education course. Education Certificates are issued for snowmobiles, ATVs, and motorcycles. 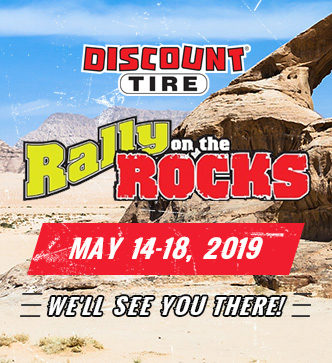 For information on this training opportunity, contact the OHV Education Office at 801-538-7433 within the Salt Lake City area or toll-free at 801-538-7433. Any OHV being operated or transported on public lands, roads or trails of the state of Utah must display a current OHV registration sticker. Dual sport off-highway motorcycles may be registered as street legal vehicles if they possess the proper safety equipment, have passed a state safety inspection, and carry the proper insurance, or they may be registered as off-highway vehicles. All OHV registrations are handled by the Utah Division of Motor Vehicles. Owners of ATVs, off-highway motorcycles, or snowmobiles brought into Utah by non-residents must obtain a non-resident permit for their machine. Non-resident permits cost $30 and are good for one year from the month of purchase. Some states offer reciprocity, meaning there is a mutual agreement between states not to charge non-residents fees. The following is a list of states that do not have a reciprocity agreement with Utah. If your state is listed below, you MUST purchase our ‘Non-Resident Permit’. Note: This list is updated frequently by the state of Utah. 1. Proof of residency: driver’s license or other state issued identification. Revenues generated from OHV user fees are dedicated to construction, improvement, operation and maintenance of OHV trails. * A muffler and spark arrestor (snowmobiles are exempt from the spark arrestor requirement). Properly fastened helmet, having at least a “DOT Approved” safety rating for motorized use are required for all OHV operators and passengers under the age of 18 years. A properly fitting, safety rated helmet is the most important piece of safety gear available to an OHV rider. By following a few simple rules, OHV riders can make certain that every trip is a safe and enjoyable experience. * Always ride in control. Ride within your abilities and your machine’s capabilities. Never attempt anything that is beyond your skill level. * Always wear the appropriate safety gear. At a minimum, this should include a helmet, shatter resistant eye protection, long sleeves, long pants, gloves, and boots that cover the ankle. * Only carry passengers if your OHV is specifically designed to do so. ATVs and off-road motorcycles are designed to be ridden by only one rider. Carrying passengers can alter the balance of the machine, causing a loss of control. * Riders under the age of 16 should be supervised by a responsible adult at all times. * Riders should be able to straddle the machine with a slight bend to the knees while both feet are on the footrests. Riding a machine that is too big is a major cause of injuries to young riders. * Always tell someone where you are going and when you will return. Provide them with a map of your intended riding area. * Be prepared for any emergency. Always carry a tool kit and spare parts, a first aid kit, and survival equipment when you ride. Carry plenty of extra food, water and fuel. * Never, ever drink and ride. Alcohol and OHVs don’t mix, but create a deadly and illegal combination.